Robert DeNiro and Al Pacino star in the Martin Scorsese movie The Irishman, coming from Netflix, a film that they are going to spend even more money trying to buy a Best Picture Oscar for than they did for Roma ($50 million). The Irishman was filmed on a $150 million budget, making it Martin Scorsese’s most expensive film. 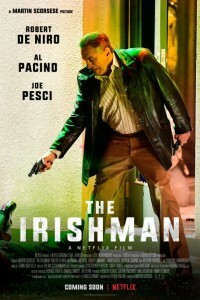 The film explores the years Frank ‘The Irishman’ Sheeran (Robert DeNiro) spent as a mob hitman. Sheeran was allegedly involved in the death of infamous mob boss Jimmy Hoffa, who went missing in July 1975 and was never found. 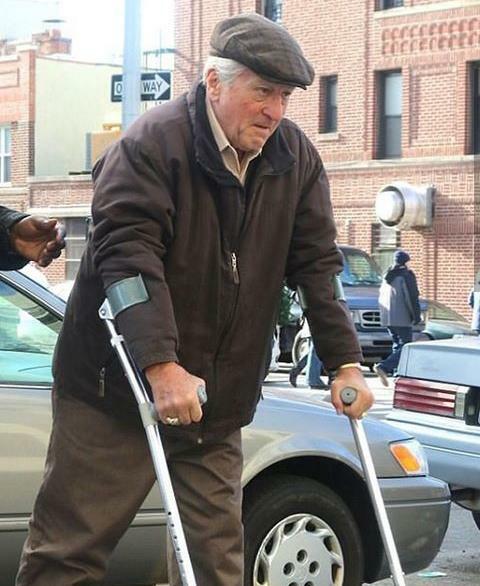 Played by DeNiro, 74, the film follows Sheeran as an older man looking back at his mob career. Joe Pesci, who won a Best Supporting Actor Oscar nearly 30 years ago for Martin Scorsese’s Goodfellas, also stars in the film. Rounding out the cast, Ray Romano, Oscar winner Anna Paquin, Bobby Cannavale, Jack Huston, Jesse Plemons, and Harvey Keitel. Leonardo DiCaprio lends his talent in three scenes as Robert F. Kennedy, who was Attorney General during key times throughout the story. Steven Zaillian, who won the Best Adapted Screenplay Oscar in 1994 for Shindler’s List, wrote The Irishman screenplay. The film is based on the 2003 book I Heard You Paint Houses by Charles Brandt. Zaillian has previously worked with Martin Scorsese on Gangs Of New York, earning a Best Adapted Screenplay Oscar nomination for that film. The Irishman will mark the first time Pacino and Scorsese will have worked together and the first time all the Italian greats, Robert DeNiro, Al Pacino and Joe Pesci, are on the big screen together. 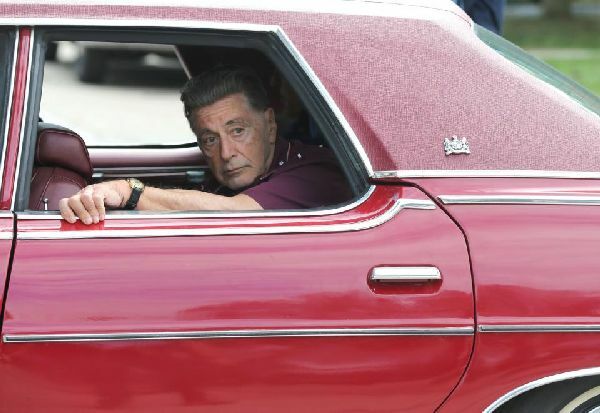 Check out Al Pacino in character as Jimmy Hoffa, below, replete with wig. Also, Robert DeNiro in character as The Irishman. 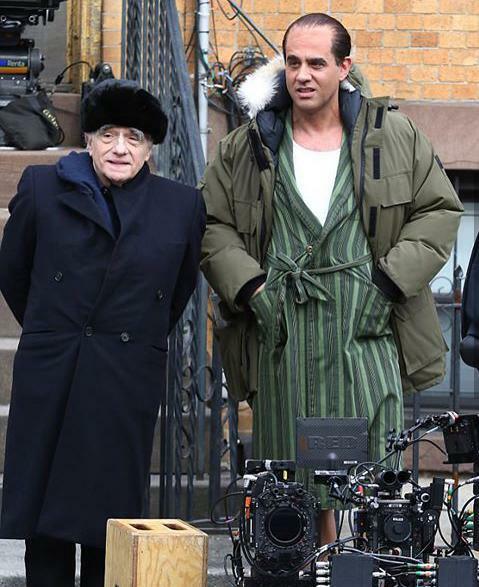 And Martin Scorsese and Bobby Cannavale on the set of the film.